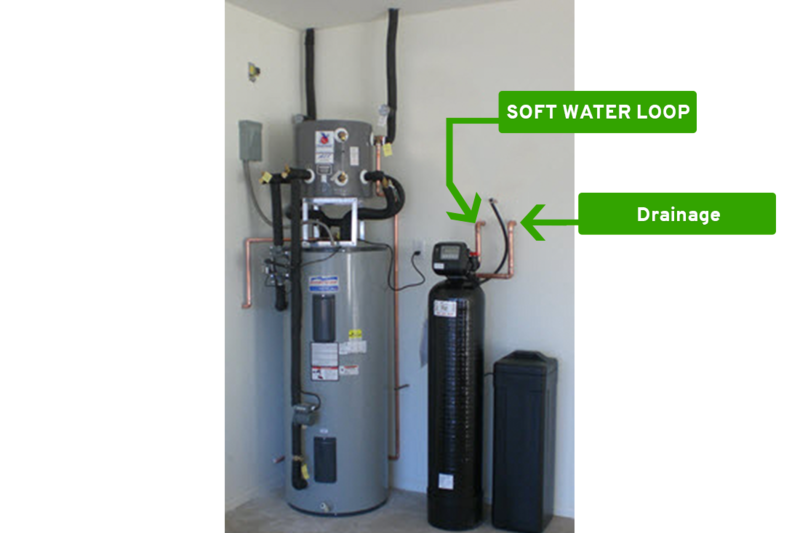 New homes in Arizona are typically plumbed with a soft water loop. Typically, if you have a soft water loop, there will be a 3/4" copper line sticking out from the wall beside your water heater. Prior to having a soft water softener installed, this copper line will be a "loop" sticking out from the wall where both lines are connected. When we install a soft water system, we will simply remove the loop and plumb in the softener as shown in the picture below. There should also be a drain line fairly close which we will tie into. After the soft water system is installed, the soft water will run throughout your house. When a house if pre-plumbed with a soft water loop, the hose bibs located outside are not included in the soft water loop and therefore provide hard water to be used for any hose locations, irrigation, and for pool auto fills. AZ Water Solutions offers soft water loops in Phoenix, AZ. If your home was not built with a water softener loop, and you want to install a soft water system, your exterior hose bibs will need to be isolated from the soft water so that you don't kill your grass and plants with the softened water which contains salt from the soft water system. Soft water will not hurt your pool, but you will use more salt if your auto fill is connected to your pool, so its best to get a hard water line to your pool as well.